For our music video we have chosen to include the "made" concept. 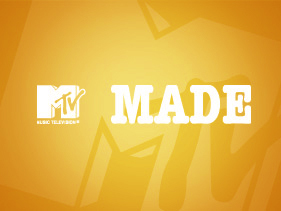 Made is a television programme from the channle MTV where a person is coached to become their dream. Some examples is beign turned form a "geek" to a prom queen, a "nobody" to a cheerleader. The concept of the programme relies heavily on the labelling of teenages and and their need to conform, for various reasons. Our video will follow this idea that a tomboy feels that she needs to be girly to get the boy shes always loved. With the help of her coach she will transform from his best "like-a-guy" friend to the girl he realises he loves. Using Video diary entrys ( to show the performance element of our video) and other elements of the programme cush as the notepad style updates we will show we are trying to partray the programme. We chose this for our video as it tells our conventional boy/girl love story in a unique way which teeangers will recognise. Following the concept of made, at the very beginging of our music video we will have various people in various locations saying they want to be 'made' and then the last person will be our artist (katy perry) who we will be getting 'made' (transformed) and the music video will be focusing on her. Above is a clip of how made does this.